Why choose a day? Celebrate often. 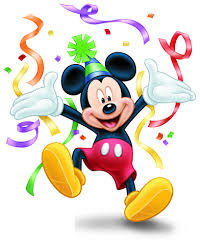 November 18 - Mickey Mouse Birthday! Happy birthday Mickey!! November 19 - National Carbonated Beverage With Caffeine Day! November 20 - National Peanut Butter Fudge Day! November 21 - National Tie One On Day! November 22 - Thanksgiving Day! Thank you Lord for each of my many blessings! November 23 - National Native American Heritage Day! November 24 - National Sardines Day! No! Just no!